The Northern Lights Will Be Visible Over Lots of the U.S. Tonight. Here's How to See It. Another work week is approaching, and it's Election Day on Tuesday, so there's a chance Wednesday is going to be a rough one. Fortunately, you can start the week on a very positive note. The northern lights may be visible over lots of the United States the night of Sunday, November 4. The Space Weather Prediction Center (SWPC) has issued a G2 (moderate) geomagnetic storm warning for Sunday night into Monday morning. That indicates an increased possibility of seeing the bucket-list spectacle across the northern United States. 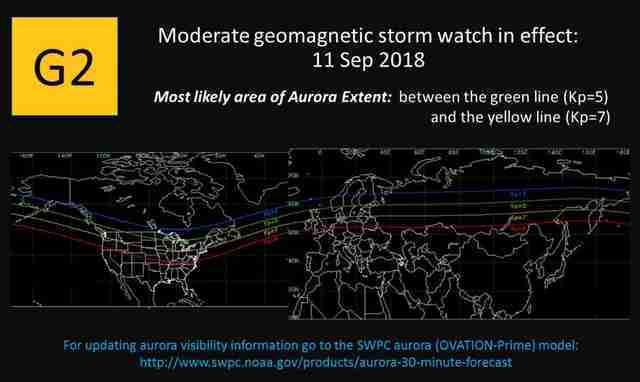 The SWPC did not issue a new map for this storm, but a map from a previous G2 warning, seen below, shows just how far south the aurora has the ability to appear under these conditions. The display might be seen as far south as the area between the green and yellow lines on the map, which includes states from New York to Wisconsin to Washington state, as well as pretty much every part of Canada. In the video above, you can see the northern lights over the Mackinac Bridge in Michigan earlier in 2018 following a G1 watch, a weaker designation than the G2 currently in place. Under these circumstances, you might not have the intense brilliance and well-defined ribbons you might find in, say, Iceland, but it's still pretty spectacular. However, seeing the display isn't just as easy as walking outside and looking up. (At least, it's not for most people.) You'll need to get far from the light pollution of urban centers. If you're in an urban area, you probably won't be able to see anything. An SWPC representative previously told Thrillist, "You need very clear skies, a good view of the northern horizon (no trees, buildings or hills), and it needs to be dark." The view of the northern horizon is important because, at least in the U.S., the display will be to the north and not directly overhead as you might find in places like Finland or Alaska. Yes, these kinds of warnings pop up from time to time, but it's not all too common to see the northern lights in the contiguous U.S. Not only do you need a situation like this, but you'll need the weather to cooperate. Additionally, the solar cycle isn't far from its minimum, making opportunities like this less frequent. 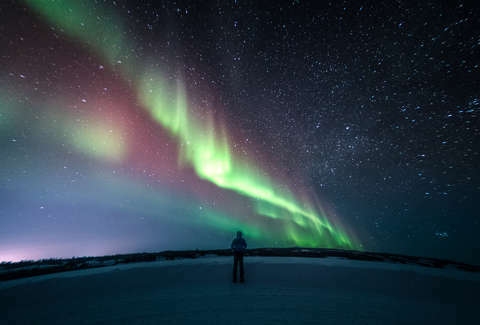 If you're lucky enough to be in the right place at the right time tonight, it's an excellent opportunity to check the northern lights off your bucket list.